Sarah Cooks: Just like Yomi-san! I stopped in at Kimurakan for a quick dinner tonight (Lt Bourke Street), hoping to satisfy my serious craving for nasu dengaku (deep fried eggplant with miso sauce). 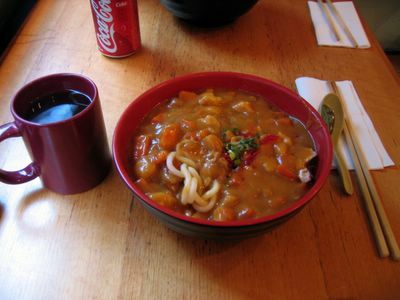 Sadly, they were out of nasu, but there was something else on the menu which caught my eye - chicken curry udon. It sounds like a strange combination, but I recently saw Yomi-san eat it in an episode of my favourite anime, Azumanga Daioh, and I really wanted to try it. It was pretty good! Only $9.